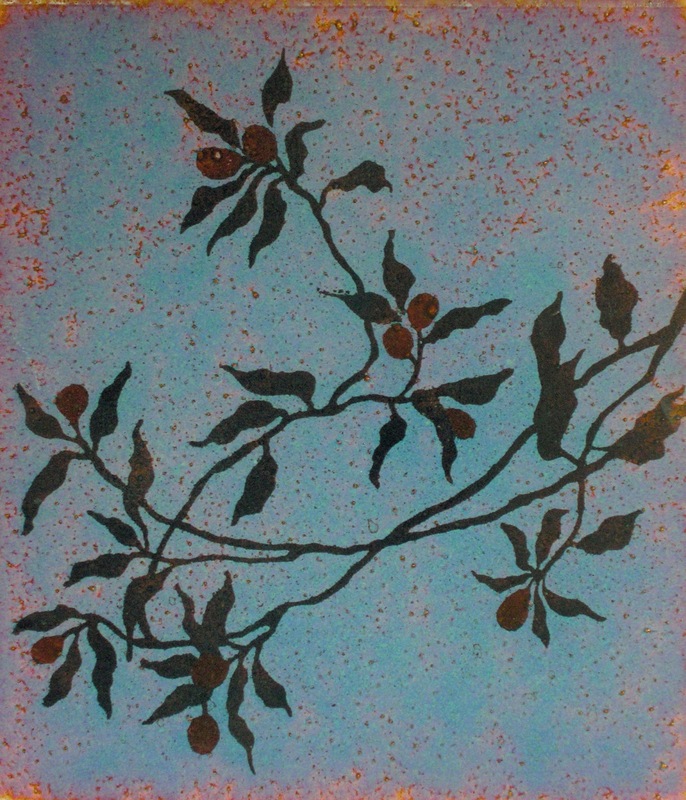 >Nancy Donnelly‘s exhibit of new works opens February 22 at VisArts Common Ground Gallery in Rockville, February 22 to March 24, 2013. Nancy Donnelly’s kiln-shaped glass sculpture and wall reliefs send out a message of spaciousness and calm. Referencing natural forms in glass, glass enamel, steel, concrete and transparent color, her work operates near a whisper, but sparks memory, emotion and imagination. An Opening Reception and Artist Talk will be held on Friday, February 22 from 7:00 to 9:00 p.m. Both events are free and open to the public. 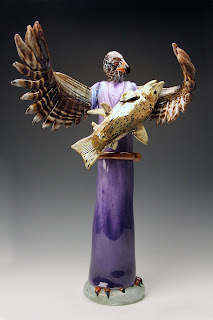 >Opening March 1, 2013, Washington, DC will host to an international exhibit of glass and clay artwork – the third collaborative exhibitions between Washington, DC artists and artists from the Sister City, of Sunderland, England. A number of the UK artists will come to the opening and will be holding demonstrations – more to come in later posts as the dates are finalized. 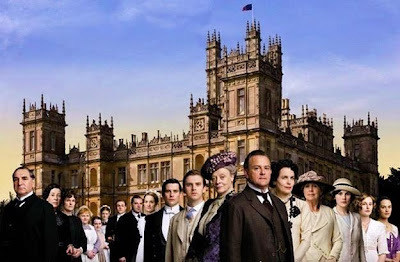 The Brits are sure to be posh, shown here in front of the Sunderland glass studios. The UK will be represented by artists Stephen Beardsell, Cris Chaney, Andrew Livingstone, James Maskrey, Inge Panneels, Megan Randall, Colin Rennie, Jeffrey Sarmiento, Midori Shinmura, Brian Thompson, Robyn Townsend, Margareth Troli, Roger Tye, Cate Watkinson, Philippa Whiteside, and Phil Vickery. 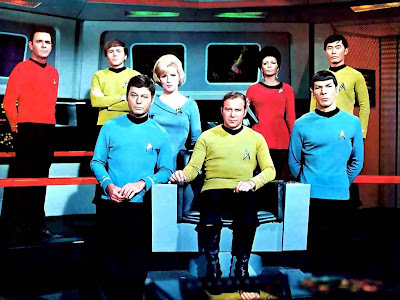 For the Americans, expect plenty of action and Tribbles. The USA will be represented by artists Margaret Boozer, Nancy Donnelly, David D’Orio, Sean Hennessey, Jeff Herrity, Joe Hicks, Michael Janis, Ani Kasten, Tamara Laird, Laurel Lukaszewski, Syl Mathis, Allegra Marquart, Tim Tate, Erwin Timmers, Novie Trump, Elizabeth Vorlicek and Audrey Wilson. It will be an interesting exercise to see if there are cultural differences visible in the works as they are exhibited side by side in Pepco’s Edison Gallery. I’ve noticed that a number of the UK Studio Glass artists works involve components that were created with the waterjet cutter that is at National Glass Centre at the University of Sunderland. Expat Jeffrey Sarmiento, one of the UK artists, gave a quick demo of their waterjet during our Fulbright Fellowship assignment in Sunderland this past March. Click HERE to jump to that post. The integration of digital technologies is transforming glassworking methodology as well the visual language of the artworks by overlapping the realms of applied art, design and craft. We will begin posting some “teaser” images of artwork – from both sides of the pond – in upcoming blogposts. 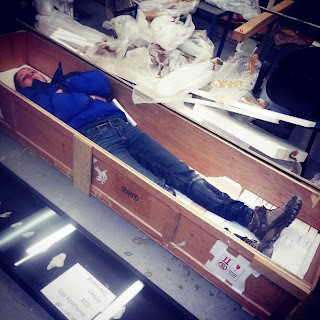 The crates of artwork from the UK have been shipped and are on the way to Washington. Below is an image of the Sunderland artists as they packed. Customs has been notified. 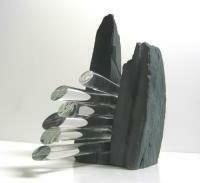 Robyn Townsend will be one of the exhibiting UK glass artists that will be here in DC for the show opening. Hopefully, for Robin’s sake, airholes were in the crate cover. “International Glass and Clay 2013.” Artomatic presents this international glass and clay exhibition, featuring work from DC area artists, as well as artists from Sunderland, England. At Pepco Edison Place Gallery, 702 Eighth Street (between G and H Street), March 1 through March 22, 2013. Something that will shock you out of the winter blues. The Washington Post’s Spring Arts Preview Lists the International Glass + Clay show in this weekend special guide to the whats coming up for the DC area. Jump to listing – click HERE: (scroll down to March 1). 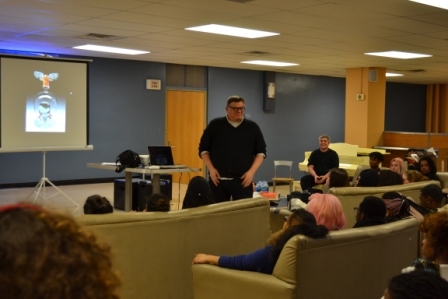 Tim Tate and Sean Hennessey were invited to speak to the visual arts students of DC’s Duke Ellington School of Arts. The two talked about glass, the business of being an artist and about their work. 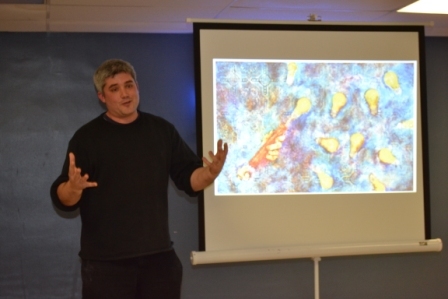 Sean Hennessey outlines his process and integration of electronic media into his cast glass panels. 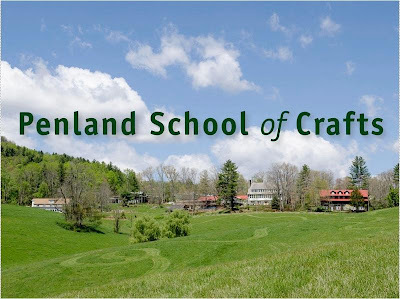 The Visual Arts department offers a sequence of courses in drawing, two-dimensional concepts, painting, sculpture, photography, computer graphics design, and art history. As they develop and progress, students may also choose elective courses in computer graphics, print-making, AP art studio, sculpting, and painting. Students will begin assembling their best works into a portfolio in the 11th grade year as a record of production and to use in applications to art schools and universities. 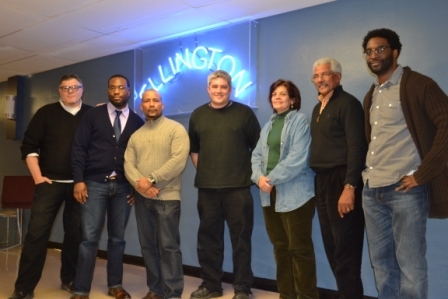 Tim Tate and Sean Hennessey with art teachers and the principal of Duke Ellington School of the Arts. Upon returning, both Sean and Tim expressed how impressed they were of the artworks and the interest in artwork media by the students of Duke Ellington. Said Tim of the experience of working with the young students – “I’m not sure who was more inspired, Sean and I or them!”. More interactions between Washington Glass School and the Duke Ellington School of the Arts are being planned. 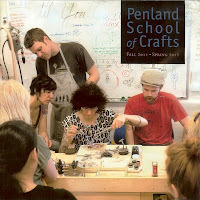 ~why are so many artists committed and dedicated for life to help Penland succeed. Please join us Saturday, Feb. 9th at 11:30am at the Washington Glass School for this labor of love. Few places have influenced the artist at the glass school and the artists of the Washington region as profoundly as Penland. If you are already a devotee, come join us and help spread the word about this unequaled opportunity for artists. The visiting artist duo kick things off with a glassblowing demonstration on Friday, January 25 at 8:00 pm. The husband/wife team are based at the Chrysler Museum of Art Glass Studio, Norfolk, VA, where both Robin and Julia teach, and Robin is the Glass Studio Technician. 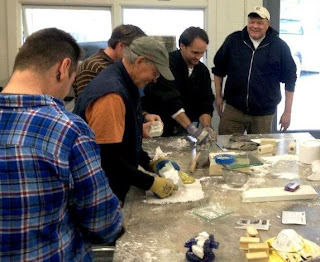 The free demo is followed by a special weekend workshop for intermediate to advanced glassblowers--Beyond the Vessel: A Glass Sculpting Intensive. Check DC GlassWorks website for more info on the class and demo. Julia and Robin Rogers working at Chrysler Museum Hot Shop. Pouring the magic onto glass. On Saturday, January 26, make your own metal robot! You make a foam robot and the DC GlassWorks casting crew transforms it into aluminum. DCGlassWorks is located at 5366 46th Avenue, Hyattsville, MD. Queen Victoria strolls thru the grounds of the Washington Glass School and Flux Studios. 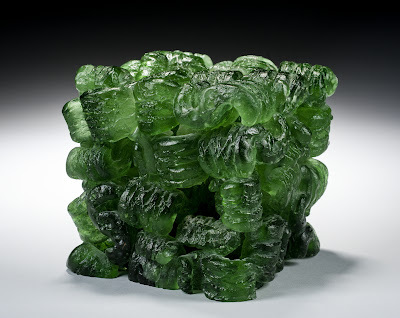 US/UK exhibit of glass and ceramics, March 1 – 23, in Washington, DC. Artists and artwork will soon be arriving from the UK’s Creative Cohesion and University of Sunderland, and DC – based artists represented by the Washington Glass School and Flux Studios will be acting as “cultural ambassadors” facilitating the exchange of ideas and images. In addition to a spectacular exhibit, a number of demos and workshops are planned during the month at the gallery and the DC area studios. The International Glass + Clay show opens March 1st and will run through Friday, March 23, The exhibit is free and open to the public. The Gallery Place Metro station is within walking distance of the Gallery. The Downtown Business Improvement District (Downtown BID), in partnership with Artomatic, Inc., the Office of the Secretary for the District of Columbia, and Sunderland City Council, have together organized the international exhibit, hosted at Pepco’s Edison Gallery. >The Trawick Prize: Bethesda Contemporary Art Awards is now accepting applications for the annual juried art exhibition and awards. $14,000 in prize money is awarded annually to the top four artists and a group exhibition of the finalists’ work will take place in September 2013 at Gallery B in downtown Bethesda. With a top prize of $10,000, The Trawick Prize is one of the largest and most prestigious contemporary art awards in the region. 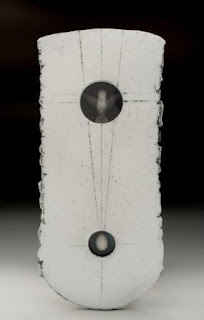 Glass Artist Dave D’Orio won second place in the 2012 Trawick award. The 2013 competition will be juried by Cynthia Connelly, Visual Arts Curator at Artisphere in Arlington, VA; Alexander Heilner, Associate Dean of Design and Media Studies at Maryland Institute College of Art in Baltimore; and Vesela Sretenović, Senior Curator of Modern and Contemporary Art at The Phillips Collection in Washington, D.C.
Artists must be 18 years of age or older and residents of Maryland, Virginia or Washington, D.C. Original painting, drawing, photography, sculpture, fiber art, digital, mixed media and video are accepted. The maximum dimension should not exceed 96 inches in any direction. No reproductions. Selected artists must deliver artwork to the exhibit site in Bethesda, MD. All works on paper must be framed to full conservation standards. Each artist must submit five images (10 for 3-D work), application and a non-refundable entry fee of $25. Artists may apply online or download an application at http://www.bethesda.org/bethesda/trawick-application. 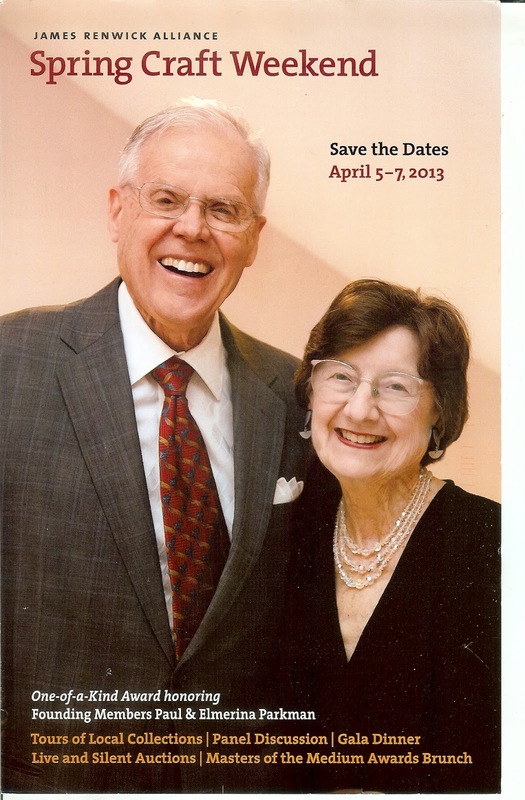 Also JRA Founding members Elmerina & Paul Parkman will be honored with “The One-of-a-Kind of Award”. Elmerina and Paul Parkman have been collectors of American studio glass since 1971, with a particular interest in documentation of this movement as it has evolved. They traveled extensively to attend glass events and to visit craft schools, artists’ studios, museum exhibitions, and gallery shows. 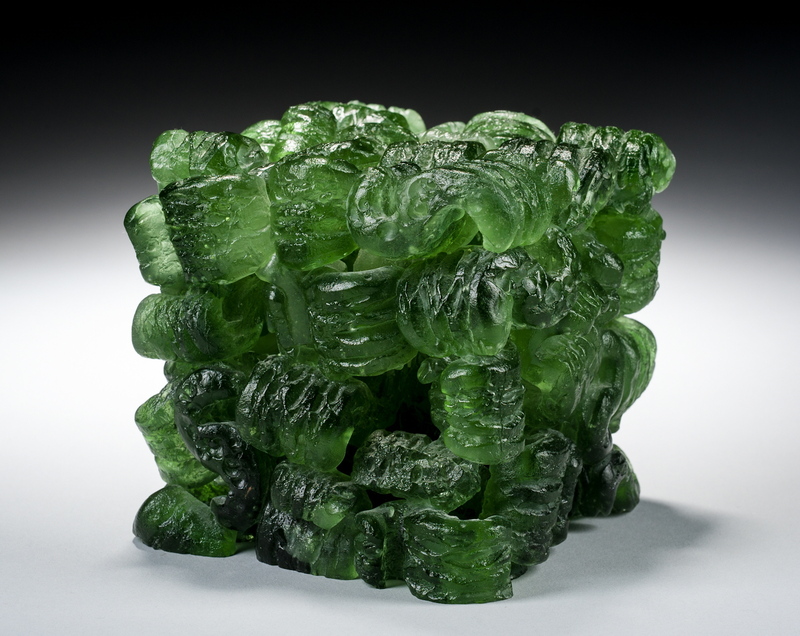 Erwin Timmers Featured in AAC Exhibit "Interwoven: Art. Craft. Design"
Arlington Arts Center (AAC) hosts the national exhibit INTERWOVEN: Art.Craft.Design. 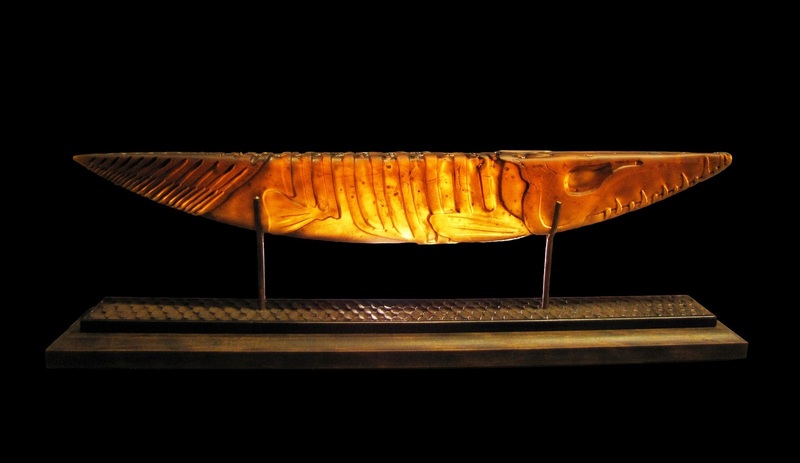 The AAC mounted this exhibition as a way to emphasize and expand the creative dialog around the ever-blurring boundaries between craft, design and fine art. Juried by Melissa Messina, Senior Curator at the Savannah College of Art and Design and Kathryn Wat, Chief Curator at the National Museum of Women in the Arts, the jurors were especially interested in artists who explore DIY practices, engage in the reclamation of craft-based materials, re-examine design aesthetics, and otherwise reinvent cross-disciplinary genres within the dialog of contemporary art. Juried Artists: Erwin Timmers, Mt. Rainier MD; Jehanne Arslan, Oakton VA; Gertrude Berg, Brooklyn NY; Allison Bianco, Silver Spring MD; Ryan Brennan, Brooklyn NY; Caroline Wells Chandler, Long Island City NY; RL Croft, Manassas VA; Matthew de Leon, Brooklyn NY; Nikki Farrand, Richmond VA; Samantha Fields, Avon MA; Joe Fish, Fairfax VA; Maggie Gourlay, Rockville MD; Clarissa Gregory, Baltimore MD; Melanie Kehoss, Arlington VA; Lily Kuonen, Jacksonville FL; Heidi Leitzke, Lancaster PA; Shawne Major, Opelousas LA; Susannah Mira, Houston TX; Rebecca Mushtare, Oswego NY; Marc Robarge, Falls Church VA; Katie Shaw, Richmond VA; Kristin Skees, Hampton VA; Jessica Smith, Tybee Island GA; Olivia Valentine, Brooklyn NY; Saya Woolfalk, Brooklyn NY; Martine Workman, Washington DC. An intriguing array of artwork with unusual subject matter and a surprising range of media—awesome glass work, video, window decals, fiber work, photography, books, light boxes, mixed media sculpture, and an original wall mural in the Tiffany Gallery--from artists working around the corner and as far away as Houston, TX.